Welcome to Ceasefire-Land, where the Palestinians talk about peace even as they continue shooting at Jews. Just hours after Palestinian Authority Chairman Mahmoud Abbas (aka Abu Mazen) yesterday declared an end to violence at the summit in Sharm el-Sheikh, Palestinian terrorists opened fire at an Israeli army checkpoint in northern Samaria. I guess they didn’t get the memo. Then, late yesterday evening, the army announced the arrest of a Palestinian terrorist from Abu Mazen’s own Fatah faction who was planning to carry out a bomb attack against Israelis near Jenin. Shortly thereafter, Palestinian gunmen fired at an IDF outpost near the Jewish village of Har Bracha, on the outskirts of Shechem (Nablus). Earlier today, Palestinians opened fire on Israeli soldiers near the village of Kadim in northern Samaria, a Hamas terrorist near the Kissufim junction in Gaza was killed as he tried to fire a rocket at an Israeli vehicle, and an Israeli was injured by rock-throwing Palestinians northwest of Ramallah. 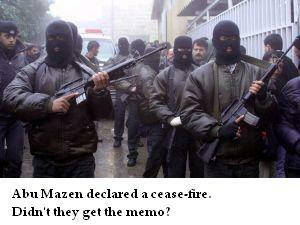 Call me a cynic, but I thought that a “ceasefire” meant that the terrorists would actually, well, cease to fire. Of course, that has yet to occur. But don’t expect to read about the any of this in your friendly, neighborhood newspaper, as the last thing the mainstream media wants is to rain on the peace parade that began at yesterday’s summit. But don’t be fooled by all the pageantry and handshakes. What counts is not what the Palestinians promise, but what they do. And thus far, they have continued to shoot. Stay tuned.